Banana Bread Waffles are the perfect breakfast for banana bread lovers. They take just minutes to make and taste like your favorite banana bread recipe. Add dry ingredients to wet ingredients and whisk until just incorporated. 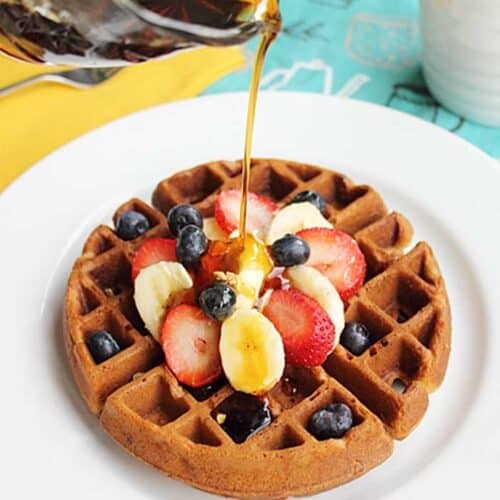 Pour 1/2 -3/4 cup onto hot iron depending on the size of your waffle iron. Mine takes almost 3/4 cup but I have a large Belgian waffle iron. Place cooked waffle into oven directly onto rack. continue cooking the remaining waffles. Serve with butter and syrup and your favorite toppings such as fruit and nuts. These reheat well in the toaster or toaster oven for a quick breakfast.